Features: works with Maestro ADS-MRR module to allow installation of new receiver in select Volkswagen vehicles retains the use of your steering wheel audio controls and navigation outputs in select vehicles retain Bluetooth with select Kenwood, Alpine, and Pioneer touchscreen receivers Vehicle Compatibility: Volkswagen: 2012-15 Beetle 2009-15 CC 2010-15 Eos 2010-14 GTI 2010-14 Golf 2013-14 Golf R 2011-15 Jetta 2010-15 Passat 2011-15 Tiguan . IDatalink ADS-HRN(AV)-CHR01 Factory Integration Adapter. Installation note: This adapter must be used with the iDatalink Maestro ADS-MRR module and iDatalink Connec ADS-HRN(SR)-CHR01 adapter to connect a new car stereo to your Chrysler-made vehicle. IDatalink's HRN-RR-VW1 interface harness allows you to connect a new car stereo in select 2009-up Volkswagen vehicles, working in conjunction with iDatalink's Maestro ADS-MRR module. iDatalink Connec HRN-RR-VW1 Factory Integration Adapter. IDatalink HRN-RR-VW1. VW1 Volkswagen Plug and Play T-Harness for Maestro RR. - 2012-15 Beetle. Compatible with select GM vehicles. - 2010-14 Golf. - 2013-14 Golf R. Self installation voids the warranty if any. Note: This harness must be used along with theAX-ADXSVI interface. This harness must be used in conjunction with theAX-ADXSVI interface box. Prewired ASWC-1 harness included. Chrysler 200 2011-up. Chrysler 300 2008-2010. Part Number: BAA8. With this setup, you can use the FM modulator device and still keep your regular, factory antenna for use with your OEM radio head unit. Need a new antenna cable to reconnect the factory antenna back to your OEM radio head unit?. SELECT VOLKWAGON DATA INTERFACE W/ SWC & FACTORY DISPLAY RETENTION 2015. Beetle 2015. Retains balance and fade. Retains most of the vehicle settings that was displayed on the. AXXESS AX-VW903 WIRING INTERFACE. Note : The PGHVW2 cannot be used as a stand-alone adapter. Plug-and-play harness, for use with the PXAMG, PXAUX, HDRT & ISBT21 interfaces. Volkswagen EOS. Volkswagen GTI. Volkswagen Jetta. Volkswagen Passat. If the vehicle is equipped with retained accessory power features, the XSVI will keep those features. Also provides outputs for Speed Sense, Reverse, and Parking Brake. Provides NAV outputs (Parking Brake, Reverse, Mute, and Speed Sense). IDATALINK MAESTRO ADS-MRR INTERFACE MODULE . 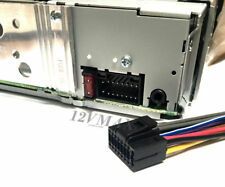 iDATALINK HRN-RR-VW2 INTERFACE HARNESS. iDatalink Maestro ADS-MRR Interface Module. Important Note: iDatalink Maestro RR is not compatible with a Mac. Once the unit has been "flashed," it's ready to go. This is a part designed and manufactured in the USA by Blitzsafe. -We have been told that these cars all have the glove box CD changer connection. If your car has the CD changer connection in the glove box you do not require the splitter unless you are using the Dension GW16AC1, USA Spec PA11-VW6 or factory iPod adapter that uses the CD changer port (non text). 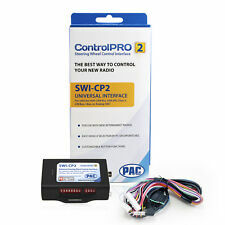 PAC C2R-VW2 02-13 Radio Replacement Interface. Condition is Used. Shipped with USPS Priority Mail. Wiring Harness Connect a New Car Stereo on select 2000-2012 BMW- Volkswagen - MINI Vehicles Powers 4 Speaker, Plugs Into Car Wire Harness Antenna AM/FM Adapter. Includes 2 Wiring Harness and 2 Antenna Adapters. REPLACES 40-EU55 EU-8 Vwa4B NEW. VW GTI DOUBLE DIN 2003 - 2005. VW GTI 2006 - 2007. VW JETTA 2002 - 2007. NEW ANTENNA ADAPTER VOLKSWAGON/VW GOLF/GTI/JETTA. 40-EU30 Antenna BMW Audio VW Adapter Pair New VW/BMW/European antenna adapters for adding FM modulator,etc. Replaces Metra Part Numbers 40-EU30 , (40-EU10 40-EU20) Replaces Scosche Part Numbers VWA3B VWA3RB Replaces American International Part Numbers: EU-6 EU7. IdataLink HRN-RR-CH1. 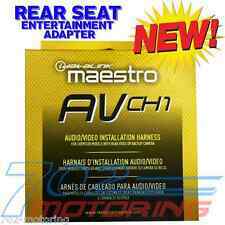 Maestro Plug and Play ADS-MRR T-Harness for Select 2007-14 Chrysler, Dodge and Jeep Vehicles. 2008-14 Grand Caravan. Self installation voids the warranty if any. We may require receipt of professional installation/bench Test report to establish it was professionally installed and the issue was with the product and not installation. PAC C2R-VW2 Radio Replacement Interface Open box but NEW! Never used. Shipped with USPS Priority Mail. TheSWI-CAN isnot a standalone device. The red wire on theSWI-CAN is an accessoryOUTPUT. Vehicle Compatibility Interprets the CAN Data to a usable signal that the SWI-RC module can use. Add-on module for use with SWI-RC in any of the vehicles in the above table. Speaker Harness Adapters for select Audi, Chevrolet, Ford, Isuzu, Kia, Mazda, Nissan, Subaru, Volkswagen vehicles only. It is important to us that if you see our products being used in the lanes, that you have access to obtaining those products. For select 2002-2007 Audi, BMW, and Volkswagen vehicles. - Kick Panels. - Empty Sub Boxes. - Fuse Holders. - Installation Harness. - OEM Harness. For select 2002-2007 Audi, BMW, and Volkswagen vehicles. Skoda All models with Quadlock. All wiring harness includes power and speaker wires and each is labeled with its specific function. The wiring color codes are ISO standard. Suitable models: Volkswagen Golf, Passat, Touareg, Touran 2002 . Axxess XSVI-9003-NAV. • Used in non-amplified systems or when replacing amplified system. • Provides NAV outputs (Parking Brake, Reverse, Mute, and V.S.S.). Non-Amplified Non-OnStar Harness. • ASWC harness included (ASWC not included). Metra Wire Harness for Select 1986 Volkswagen Vehicles 70-1784 New Open Box! PAC RP4-VW11 Instruction Manual. - Factory Radio. - Signal Processors. - UTV Side by Side Speakers. - Signal Path Devices. - Wireless Microphones. - Audio Signal Processing. - Video Installation Parts. Before installing you must program the adapter at the iDatalink site to work with your particular vehicle. Signal Processors/ Equalizer. 2010-15 C/V-Factory Radio- RER, RHR, REN or RES (w/out Phone on Radio)Jeep. The SMB connector enables versatile use. 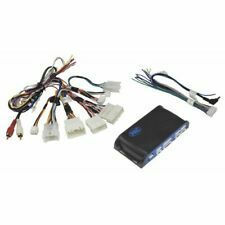 VW-9000 Aftermarket Radio Wiring Harness for Select Audi/Volkswagen/Ram. Condition is New. Shipped with USPS First Class Package.